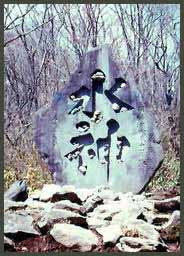 This memorial for the God of Water one is in the neighbourhood of Sendai, near a temple of Yakushi Nyorai at Hoozawa. This stone memorial is two meters wide and about eight meters high, all of one huge stone.
. . . CLICK here for more SUIJIN SAMA Photos ! Since in 2004 there were so many typhoons hitting Japan, I am now checking out about the Gods of the Elements, while Typhoon Nr. 22 is hanging around on October 8. Especially the Gods of Water and Rain and the Wind need to be appeased these days. I am very greatful for Mark Schumacher and his kind support and fruitful discussion of this subject. Each of the gods also has his female counterpart, a sort of heavenly princess KI, 妃. In other context, they may look different、as we will see below. These gods may have evolved from animistic believes in India and Japan, whereby the reading of JIN may refer to a Japanese Deity and the reading of TEN to an Indian origin. In the pure Japanese Shintoo context, these names can also be read as for example Mizu no kamisama, Hi no Kamisama, see below. Earth, Water, Fire and Wind (Air). The four elements of antiquity -- earth, water, air, and fire -- dominated natural philosophy for two thousand years. The premise that everything was formed from these four elements was developed by the Greek philosopher Empepedocles of Sicily, and continued to be believed until the rise of modern science. Even today, earth, water, air, and fire are not bad symbols for the four states of matter -- solid, liquid, gas, and plasma. Science has discovered new ideas, but in the field of Mysticism these elements are still important today, to illustrate the oneness of all. The ancient symbol is found after each element below. Some mystics insist that these four elements be placed on the temple and home sanctum alter. Some even go so far as to have earth, water and air from Egypt, to commemorate the origin of the Mystery Schools that later migrated to many parts of the world. According to Mark, FOUR also occurs very frequently, both in ancient and traditional art in China and Japan, to represent the four directions (north, south, east, west), and also the fifth direction, the center (which in China refers to China itself). As for the Shingon and other Mandalas, I refer you to Marks page. These four gods are also part of the 12 Deva Guardians, Juuni-Ten, with their origin mostly in Indian beliefs. Great gallery of the 12 in the Kyoto National Museum. The above mentioned four elements together with the void make up the Five Elements, usually represented in Stone Markers, Gorin-Too. The earth, water, fire, wind and the sky, which Buddhists believe create everything of the universe. The bottom stone is a cube and called the Earth ring expressing the earth. From the second, a sphere (Water ring), triangular shape like pyramid (Fire ring), semi-sphere (Wind ring) and placed on top is peach-shaped hoju (mani in Sanskrit) and is called Sky ring. Among the oldest Vedic gods; the personification of the heavens, and preserver of the universe; later becomes the lord of the Sun Gods, and still later the god of oceans and rivers. 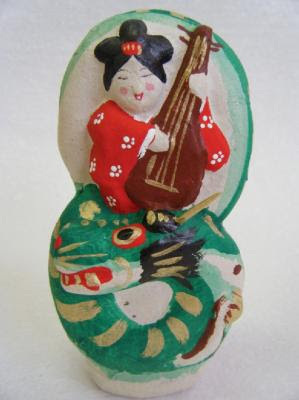 Sui-ten (Varuna) is a fair figure clothed in softly-colored and finely-decorated garments. He emerges gracefully from the dark-brown background like a water spirit, as his name, literally "water deva," suggests. His knees are highlighted with white gradations and decorated with delicate, finely detailed patterns. Such decorative techniques are characteristic of the late-Heian Period when production of Buddhist paintings was at its height. Dikpalas or directional guardians, are stationed around the four corners of many temples. The northwest corner, with guardians Varuna and Vayu is shown here. Varuna is also associated with or identical with the Dragon Deity (ryuujin, ryuuson), riding on a turtle or a dragon and living in the Palace in the Ocean (ryuugu). He holds a rope in his hand. In that version he has many snakes around his head. He is then also a protector of pregnancy and easy childbirth. Other sources present his vehicle, the animal he is riding on as a kind of crocodile-like sea monster, the Makara. Don’t miss this great page of Mark about the Dragons !
. . . CLICK here for MAKARA Photos ! As The God of Water, Mizu no Kamisama, Mizugami, Suijinsama, he is widely revered in Japan. Even in my own backyard, there is a small grotto with a stone saying 水神, who is supposed to bring enough rain for the rice fields in due time and on the other hand protect us from too much of it causing landslides and more damage. 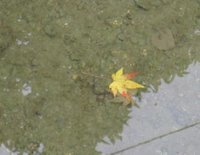 One link claims, 水神様とは下水菌のこと, Suijinsama is another name for the bacteria in the waste-water. The more you find in the water for cleaning the soil, the better is our environment. It the bacteria are reduced due to environment pollution,the earth turns to salpeter, as for example near the thatched homes of Gokan Village in Toyama 五箇山. Here another episode from my own experience comes to mind. The local carpenter decided to drain the sewage water, fill the hole up with earth and level it with the rest of the ground. But before doing anything to this smelling place, we were informed, we had to pacify the Suijinsama living in this pond. With plenty of ricewine (for the god and the humans) and purifying salt and a lot of mumbling prayers, the God was informed that his palace was to go and he would be relocated in a wet rice field further down. After the water was drained, a pipe was stuck in the hole before it was filled up, so that the Suijinsama who might have been left in the place would find their way out. This pipe is still sticking out to this day. A shrine founded in the 10th century, dedicated in part to the God of the Sea (Suijinsama). Kanda Myōjin became the tutelary shrine for much Edo, the emblematic shrine for the Citizens of Edo, the Edokko. There are thre Female Water Deities in Shintoo. One is the Funadama, Soul of the Ship. guardian deity of a boat or ship .
. 宗像の神 - The Munakata Shinto Belief .
. . . shio no mizu 潮の水（しおのみず）"tide water"
to be thrown on the roof. On this day people of old would throw water on the roof and pray for protection from fires during the coming year. The Dragon, fifth of the twelve signs of the Chinese zodiac. It used to be from the 5th day of the old fourth lunar month. 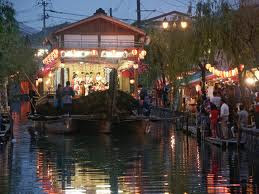 For three days and nights, three "divine boats" with girls playing shamisen moor along the canal beside the shrine. 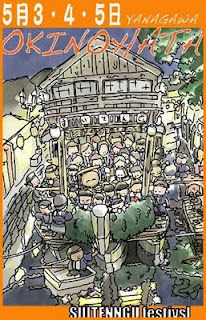 On a stage (sanjinmaru) on the boat Kabuki and kyogen performances are held to please the three deities of the shrine. While they perform, the boats float very gently along the canal. Women pray for the health of their children and to protect them from drowning. 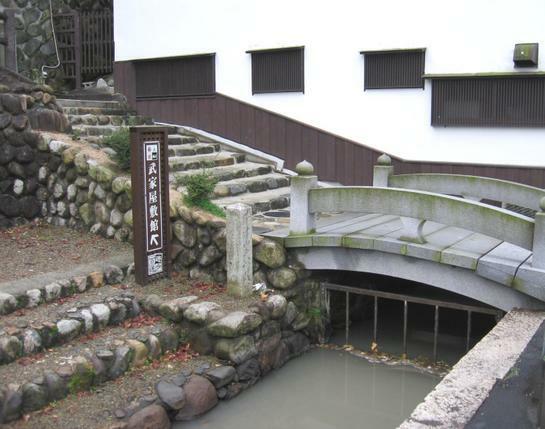 The town of Yanagawa was quite important in olden times as a stopover from Nagasaki and Amakusa (Kumamoto prefecture). Now some music groups from the Netherlands also perform. last visit to the Suitengu shrine .
. Munakata sai 宗像祭 (むなかたさい) Munakata festival . Typically appears as a elderly person, with white hair, red body armor, and holding a scepter of the wind in the right hand. The term "Futen-goshin-gassho" refers to a hand sign in esoteric Buddhist practices, acheived by creating a "ring" with the index finger and the thumb. The characters for fuu-ten mean "wind deva," and, accordingly, Fu-ten holds a scepter of the wind in his right hand. He is depicted as an old man. The elongated petals on the hosoge flower and arabesque patterns emanate a sense of dignified substance. Heavy layers of color on the face, large-scale patterns, sophisticated brushwork and a double-layered halo all contribute to the uniqueness of this elaborate Fu-ten. The Wind God and the Thunder God are another pair to threaten humanity. Here they are on a famous folding screen. Both the Wind God and the Thunder God are originally subordinates to the Senju Kannon (Kannon-with-One-Thousand-Arms), and worshipped together with other twenty-eight Attendants. 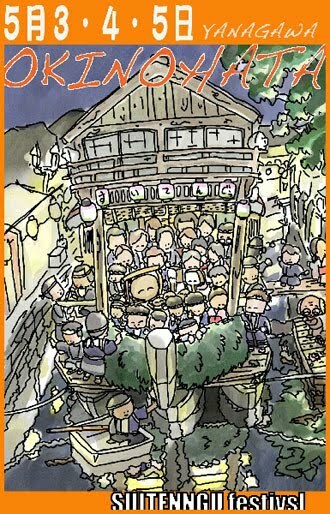 This is a copy of Sootatsu's crowning work by Koorin. While Sootatsu's original picture is characterized by a broad gold space and a composition with a strong feeling of tension, where the Wind God and the Thunder God face each other from both ends, Koorin showed a difference in creative sense by stabilizing the composition by placing the two gods at the center and trying to depict the figures of the two gods clearly with bright primary colors. 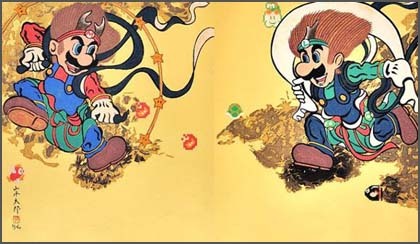 For the 30th anniversary of Super Mario Bros.
and the 400th anniversary of the Rinpa School of Japanese Painting, artist Tara Yamamoto created an astonishing piece of art that threw a traditional twist on the two well known nintendo characters, Mario and Luigi. In this painting, Mario and Luigi are depicted as the Japanese Deities Raijin and Fujin.
. with Raijin 雷神 pattern .
. Thunder and lightning .
. Kamikaze 神風 the divine wind, . 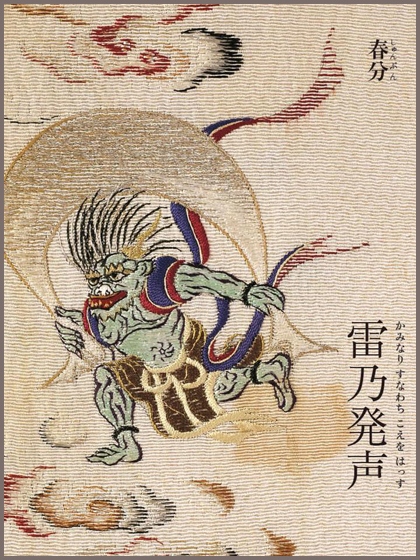 Fujin and Raijin were also seen as some kind of heavenly Oni　鬼 demons. Ji-ten, whose name means "earth deva," guards the downward direction and is the god of the earth. He is also called Kenrochijin. The vivid colors and exquisite decorative elements give this scroll an almost luminous beauty that is representative of late-Heian aristocratic tastes. On the more down-to-earth animistic beliefs of rural Japan, I think he comes as Yama no Kami and Ta no Kami, the God of the Mountains and the Fields, who changes his residence twice a year, retreating in autumn to the mountains and coming back in spring to the fields. This is a fascinating tale of its own. 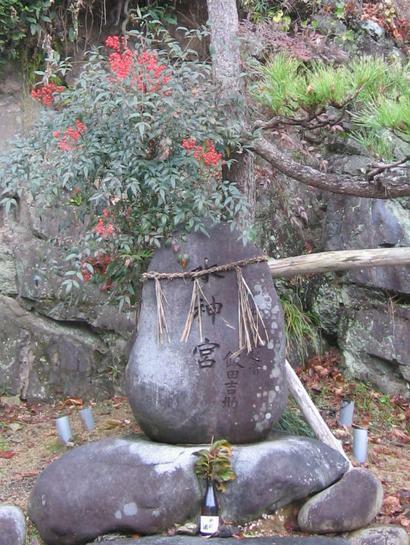 In Shinto, when a mountain is considered an object of worship, a yamamiya may be established at the summit or on the side of the mountain, as at Sengen Jinja on Mt Fuji. In some cases, the yamamiya may be regarded as an "interior shrine" (okumiya) in contrast to a shrine located in a village (see satomiya) or lower on the mountain. Some scholars see the yamamiya associated originally with ancestor worship, and thus also with the dual complex of mountain god (yama no kami) and rice field god (ta no kami). God of fire, invoked in Shingon fire rituals (Agni homa ritual); carries messages to the gods in the flames and smoke of fire; often depicted as old man with stern facial expression.
. Kappa, the water goblin 河童 - Kappapedia . one of the Russian formalists designated "the stoniness of the stone" as what art aspires to. which residents use to draw water for everyday tasks. We went to see for ourselves the unique, intimate relationship between the lives of the area’s residents and their water. This is the sign above the volunteer station in Harie. It says "The Village of Living Water." They provide tours of Harie's unique kabata culture. A kabata uses spring water, carp and streams to bring fresh water into homes. The entire system is self sustaining and is the perfect synergy of man and nature. ... Basically, water coming down from the mountains meets with the water table from the lake, and that water is drawn by the people in Harie. The guides give a wonderful explanation. This is one of the many canals that flow through Harie. The guide explained that these are very clean and . . . . .
On the 13th day of the first lunar month, farmers place 20 soy beans into the hearth. If they all become black, it will be a good harvest this year. On the 15th day of the 6th lunar month, cucumbers are offered in the hope they will induce 豊作 a good harvest.